Crude oil is the starting point for many products that we use on a daily basis, from gasoline to plastic dishes to fertilizers. But before it’s readily usable, crude oil has to be refined. North of Galveston Bay and near the mouth of the San Jacinto River, Baytown is home to the largest oil refinery in the United States. 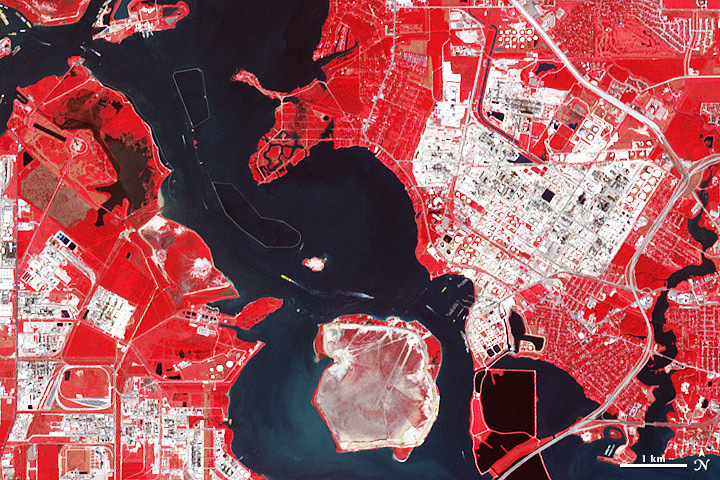 On October 1, 2003, the Advanced Spaceborne Thermal Emission and Reflection Radiometer (ASTER) on NASA’s Terra satellite captured this image of Baytown, Texas. 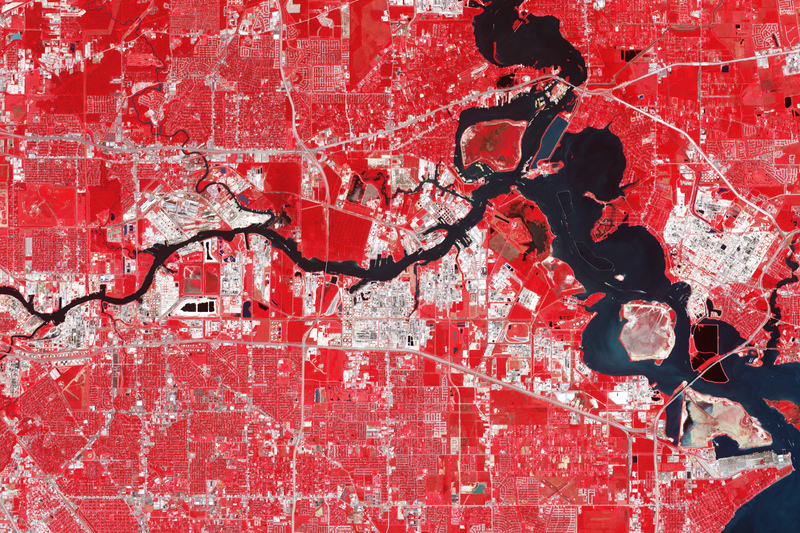 ASTER combines infrared, red, and green wavelengths of light to make false-color images that distinguish between water and land. 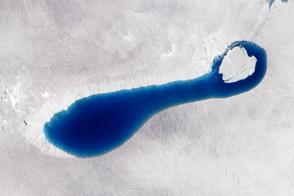 Water is blue; buildings and paved surfaces appear tan and gray; and vegetation is red, with brighter shades indicating more robust vegetation. The petrochemical complex appears in shades of beige and gray, standing out from its vegetated suburban surroundings. The plant stretches to the shore in the south, and is encircled by roads on its eastern and northern sides. Covering 5 square miles (13 square kilometers), the complex includes not just a refinery, but also two chemical plants and some administrative facilities. Settlers first arrived around Baytown in 1822, and the discovery of the Goose Creek Oil Field in Galveston Bay provoked the first offshore drilling operation in Texas. An oil refinery is ideally situated close to a transportation route, and ships have easy access to Baytown. Operated by Exxon Mobil Corporation, the Baytown refinery has a daily capacity of 560,500 barrels, according to the U.S. Energy Information Administration. According to Exxon Mobil, the refinery began operating in 1920, and the chemical plant opened up 20 years after that. The olefins plant opened up in 1979. Manufactured since the mid-twentieth century, olefins are synthetic fibers used in clothing and household products. 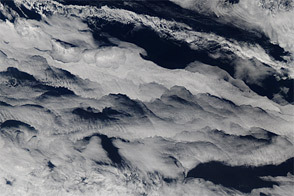 Image courtesy NASA Jet Propulsion Laboratory Photojournal. Caption by Michon Scott. 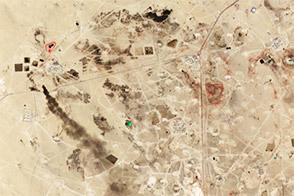 This false-color image shows the largest oil refinery in the United States. Baytown Area. About Us.Exxon Mobile. Accessed October 26, 2012. City of Baytown. (2011) History of Baytown. Accessed October 31, 2012. Freudenrich, C. How oil refining works. Accessed October 31, 2012. Seba, E. (2012, October 4) Fire hits diesel hydrotreater at Exxon Bqytown refinery. Reuters. Accessed October 26, 2012. U.S. Energy Information Administration. (2012,July 12) U.S. Refineries’ Operable Capacity. Accessed October 26, 2012.